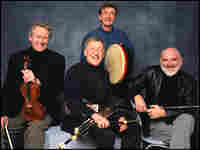 The Chieftains, Ambassadors of Celtic Folk In 1962, Dubliner Paddy Moloney put together a band to play traditional Irish music, and to celebrate his homeland's folk culture. More than 40 years later, The Chieftains are going strong. In 1962, Dubliner Paddy Moloney put together a band to play traditional Irish music, and to celebrate his homeland's folk culture. More than 40 years later, The Chieftains are going strong, collaborating with everybody from Ziggy Marley to the Rolling Stones. Monday, the band paid a live visit to NPR's Studio 4A. Over the course of putting out 30 albums, The Chieftains have won 6 Grammy Awards. And while many acknowledge that Celtic music would have survived without them, the band has won fans by whistling and dancing their way around the globe. A new two-CD box set chronicles The Chieftains' career from 1977 to 2002. The Essential Chieftains has the band working with the likes of Bela Fleck and Emmylou Harris, Linda Ronstadt and Elvis Costello, among others. Over the years, the band has transcended its role as musical ambassadors, becoming an institution in its own right. Paddy Moloney (whistle and pipes), Sean Keane (fiddle), Kevin Conneff (bodhran), Matt Molloy (flute), Jeff White (guitar), Triona Marshall (harp) and John Pilatzke (fiddle).